Originally published in 1957, this classic work has guided generations of scholars through the arcane mysteries of medieval political theology. Throughout history, the notion of two bodies has permitted the post mortem continuity of monarch and monarchy, as epitomized by the statement, "The king is dead. Long live the king." In The Kings Two Bodies, Ernst Kantorowicz traces the historical problem posed by the "Kings two bodies"--the body natural and the body politic--back to the Middle Ages and demonstrates, by placing the concept in its proper setting of medieval thought and political theory, how the early-modern Western monarchies gradually began to develop a "political theology. "The kings natural body has physical attributes, suffers, and dies, naturally, as do all humans; but the kings other body, the spiritual body, transcends the earthly and serves as a symbol of his office as majesty with the divine right to rule. The notion of the two bodies allowed for the continuity of monarchy even when the monarch died, as summed up in the formulation "The king is dead. Long live the king." 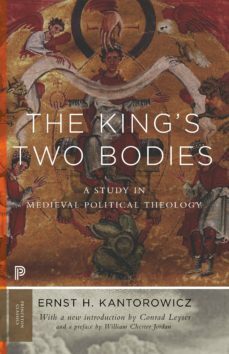 Bringing together liturgical works, images, and polemical material, The Kings Two Bodies explores the long Christian past behind this "political theology." It provides a subtle history of how commonwealths developed symbolic means for establishing their sovereignty and, with such means, began to establish early forms of the nation-state. Kantorowicz fled Nazi Germany in 1938, after refusing to sign a Nazi loyalty oath, and settled in the United States. While teaching at the University of California, Berkeley, he once again refused to sign an oath of allegiance, this one designed to identify Communist Party sympathizers. He was dismissed as a result of the controversy and moved to the Institute for Advanced Study in Princeton, where he remained for the rest of his life, and where he wrote The Kings Two Bodies.Featuring a new introduction, The King’s Two Bodies is a subtle history of how commonwealths developed symbolic means for establishing their sovereignty and, with such means, began to establish early forms of the nation-state.